I haven't built anything for a while, but was inspired by the other "another lighted Reliant" thread to crack into a new project. So here's the start. First up, light block the interior and start laying down some LEDs. You can't see it, but there is masking here for the Raytheon effect. For the upper hull, I wanted the engraved lines in the horizontal window area overlooking the saucer. So I cut out the kit plastic, and drilled windows into some grooved styrene sheets. Cut to size, I'll place the new bits over the big holes. The kit plastic I removed was *thick*, so as an added bonus I won't have to deal with thinning that out. Despite the fact that I was working with flat plastic in a drill press, the oblong windows *still* aren't right. Grr. Have to see what I can do with masks, I guess. 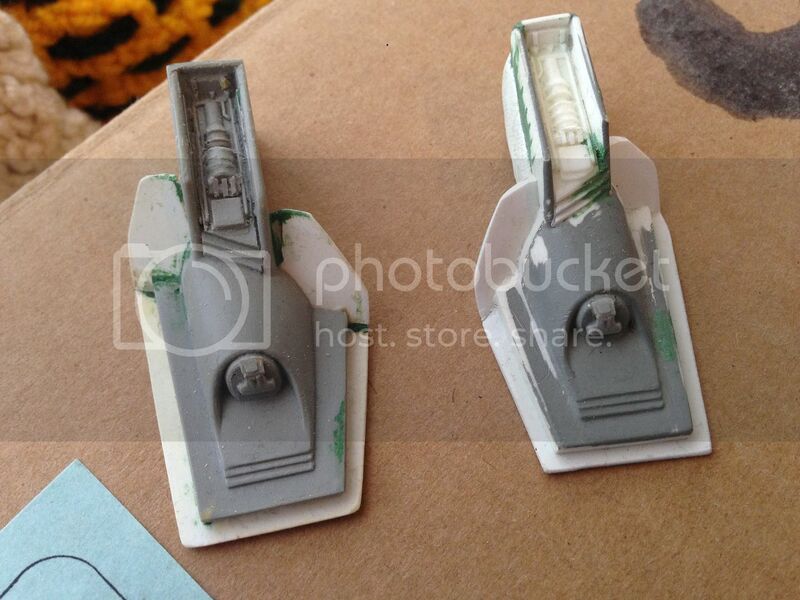 You can also see some strip styrene I ran around the edge of the b/c deck. The detail there was really soft, and I wanted to sharpen it. Turning to the nacelles, I put in holes for the spots on the inboard upper side of both nacelle fronts. I also bulked up the RCS pylons with sheet strip. The molded part was soft where it should have been sharp, way undersized, tapered in thickness from inboard to outboard where it should have been constant thickness, and not square on the corners. Fixed, now. Last thing for now is opening up the top of the roll bar and dropping in some grooved sheet styrene into the resultant hole. For now the new part is loose. Eventually, I'll glue it down and sharpen the edges of the trough with sheet strip. Next I'm going to work put the Paragraphix photo etch on the dorsal and the fantail. Probably won't get to that 'til next weekend tho. Ha! Might name it something else. It's not going to be studio-accurate anyway. Spent some time on the Reliant this weekend. Etch is now in place on the fantail. The LED strips are now in place in the nacelles. Here's a lighting test of the Raytheon effect for the nacelle's aft outboard penant. Not shown is the light test for the fore inboard spots. The bleed around the front grille is awful. This stems from the poor fit of the kit part, and I'm not sure what to do about it. I may need to go with individual LEDs for the spots, which is a nuisance. I've been playing with the bridge some. Here's the kit part in place on the hull. The kit part suffers from soft detail, and a generally toyish look. I'm tempted to bag it in favor of a Constitution class part from DLM that I have handy. Like I said earlier, screen accuracy isn't the goal here. But we'll see. Indeed. "So much the better!" 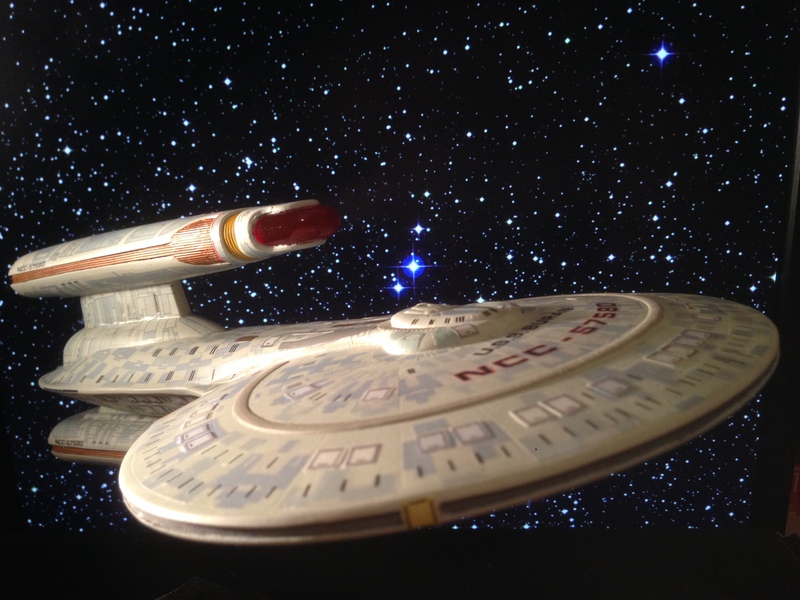 Here's a cropped picture of the Reliant studio model from the Christie's auction. There are dots atop the B deck. It looks like the one on the centerline is larger than the others, and is lit.Is that right? What are the other dots? Lights? Unlit through-hull openings? Markings? Are they proud of the surface, or flush? What's the little greeble on each of the tubular things that project out of the dorsal (I have no idea what they're called)? Looks like it was maybe a 1/35 tank suspension part? It's utterly missing from the kit. Just a thought, but in the picture you showed from the Christie's auction house the model is labeled the USS Saratoga. It was featured in Star Trek IV and is also a Miranda-class starship. So it would still be screen accurate, canon and you could still use any shot from WoK as reference. But, another USS Reliant is never a bad thing! You are doing great on the build and are really making great use of resources ("...a Constitution class part from DLM that I have handy.") to make this an exciting build! Looking forward to seeing what you're gonna do with this build! 1. The centre one is indeed bigger and lit yes. 2. No idea what they are. I "think" they are proud, but I did mine slightly lower than flush. Also, some people make them round and others consider them as little squares (I'm not sure which is correct). 3. Yes, this is missing from the kit, that's why I'm just about to release replacement parts.